"Variability is the law of life." High in the mountains, winter's deep snow melts and becomes an icy stream that gushes down the mountainside. As the weeks go by, the water's journey downhill continues. It backs up around large boulders, logs, and banks, creating warmer, shallow pools in some places, cooler and deeper pools in others. Meanwhile, aquatic species are subject to and absolutely dependent on the landscape and water features in which they evolved, including the stream's fluctuating temperature patterns. Researchers have known this for decades, but human activities and climate change have made it critical to more fully understand what makes good habitat for individual species. Water temperature was long ago identified as a key predictor of survivability for fish, and this is particularly true for salmon. In recent years, scientists have looked at mean water temperatures in rivers and streams to measure habitat suitability. Because overly warm water can be lethal for fish, scientists also have been concerned about abnormally high temperatures. A new study, however, shows that relying on only mean and extreme temperatures without regard for how temperatures change throughout a day, season, or year may oversimplify the picture of what aquatic species need to thrive. Ashley Steel, a statistician and quantitative researcher with the Pacific Northwest Research Station, recently teamed with Brian Beckman, a fisheries biologist with the National Oceanic and Atmospheric Administration, and other researchers to try to understand how thermal variability at daily and seasonal scales might affect salmon emergence, growth, and development. They also wondered whether individuals within the same stock, representing various genetic lineages, would respond similarly to altered thermal patterns. The overarching goal of the study was to determine whether ecologists, planners, and managers should consider past and predicted changes in thermal variability in addition to optimal minimum, maximum, and mean temperatures in their conservation and management plans. Chinook salmon generally spawn in the fall in gravel-bottomed rivers, depositing their eggs deep in the loose rocks. Tiny black spots -- the developing eyes -- appear on the eggs several weeks later, and scientists refer to this life stage as eyed eggs. After hatching, the young alevin remain in their pebbly nest, using their yolk sacs for nutrition. In four to six weeks they fully absorb the sacs and become fry. The tiny fry wriggle up out of the gravel, and when they are large enough to feed on insects, they are called parr. Parr spend three to 15 months in the river channel, hopefully learning to avoid predators while building the strength and stamina they need to survive the transition from river to ocean living. 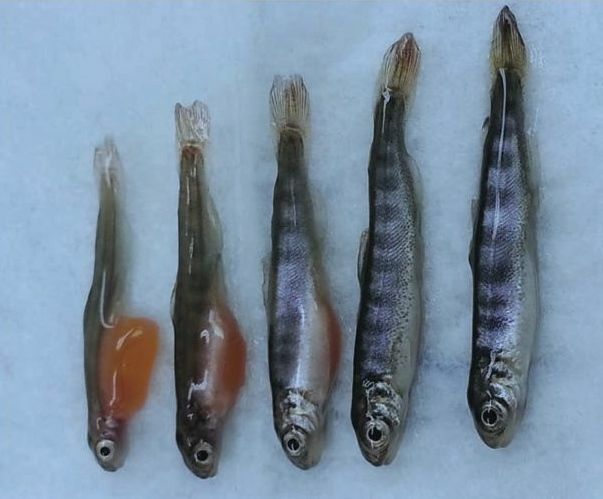 When they go through physiological changes allowing them to live in saltwater, they transform into smolts and swim into the ocean, where they live and feed for several years. Out of the approximately 4,000 eggs a female lays, only a few salmon survive to adulthood. Survivors attempt to return to their native river and migrate upstream to spawn. After spawning, Chinook salmon die and become food for bears, raccoons, coyotes, weasels, eagles, and other forest creatures. This complex lifecycle requires specific habitat conditions across entire stream networks and throughout the seasons of the year. The salmon's well-timed physiological and behavioral development depends on specific chemical reactions. "Salmon are cold-blooded, which means all their biological processes are absolutely controlled by temperature," says Beckman. "So we know that if temperatures change, there will be biological consequences. One thing that makes this particularly relevant for Chinook salmon is that they spend a lot of time in the juvenile stage in freshwater." In recent decades, land managers have used "degree days" to measure water temperature. The degree-day accumula- tion method is based on the understanding that organisms require a certain amount of accumulated heat to develop correctly. Using this method, scientists can quantify how much thermal energy an individual has received. Steel explains: "If the water temperature is 10° for one day, the egg accumulates 10 degreedays. If it's exposed to 5° water for two days, it also accumulates 10 degree-days. Chinook salmon, for example, need approximately 1,100 to 1,200 degree-days to go from fertilized egg to emergence. Scientists thought that it didn't particularly matter how those degrees were distributed -- 4° for a day, 6° for a day, 4° for a day, 6° for a day would still be 20 degreedays over four days. Five degrees for all four days would also come out to 20 degree-days." Existing research shows that extreme changes in temperature cause physiological stress in fish, but Steel and Beckman's project is the first to specifically explore different scenarios for degree-day accumulation within natural temperature ranges. The team wanted to find out if any biological consequences can be expected in terms of length, weight, emergence timing, or condition at emergence when water temperatures fluctuate in various patterns while delivering approximately the same number of degree days. "We were interested in looking at the com- plexity of water temperature and trying to understand whether there were biological consequences from that complexity," says Steel. "The relationships are not simple, but we have traditionally simplified them because we could only go out and measure the water temperature in one place at one time -- that's the data we had." Measuring methods developed over the past few decades have enabled scientists to more closely track water temperatures. "We have tiny water-temperature measuring devices that are about the size of a quarter, but a bit thicker," says Steel. "They're not terribly expensive, so we can put them in different parts of the river network and have a much more complete picture of what a river water temperature regime really looks like. They can record water temperature every minute, every hour, every day." To test the effects of various thermal patterns on the early life stages of Chinook salmon, the research team reared eyed eggs from the Cle Elum Supplementation and Research Hatchery on the Yakima River in Washington. They placed eggs from eight different genetic lines in emergence chambers designed to mimic a river bottom, and created eight water temperature regimes. They reared a set of eggs from each set of parents in each of the eight thermal regimes, for a total of 64 emergence chambers. Fairly soon after entering the chambers, the eggs began hatching. Over a period of weeks and months, the alevin reached the fry stage and began emerging into a second chamber. Each day, the team recorded the size, length, weight, condition, and state of development of the emerging fish. Of the eight temperature regimes to which the eyed eggs and alevin were exposed, all were within optimal temperature thresholds for salmon, but differed in how the degree days were accumulated. Two were kept at a relatively stable 41 °F throughout the experiment. patterns while delivering approximately the same number of degree days. "We were interested in looking at the complexity of water temperature and trying to understand whether there were biological consequences from that complexity," says Steel. "The relationships are not simple, but we have traditionally simplified them because we could only go out and measure the water temperature in one place at one time -- that's the data we had." One of the study's significant findings was that the eight family groups didn't all react to water temperature fluctuations the same way. The emergence timing of some family groups was strongly influenced by temperature variances. Other family groups emerged after a set number of degree days no matter what occurred with the water temperature. "This finding suggests that there are some genetic differences in how responsive particular populations might be to changes in water temperature regimes," says Steel. "It suggests that some genetic groups or individuals could be at greater risk, and others may be able to adapt to changing water temperature regimes. There could be strong management uses for that kind of information." The study's sample eggs were all from the same hatchery, and Steel conjectures that even larger differences might be seen among populations from different river systems. "Our eggs were all very similar, and yet we still saw some pretty strong differences in how they reacted to our experimental water temperature patterns," she says. As an example of other regimes the scientists employed, one chamber reduced the temperature by about 2 degrees each week to isolate seasonal patterns found in natural rivers. Another fluctuated temperatures by 9 degrees daily, alternating between 41 °F at night and 50 °F during the day to isolate daily fluctuations that are found in almost all naturally flowing rivers. The researchers also tested abnormal patterns. No differences in length, weight, or condition could be attributed to the different thermal regimes and those exposed to more normal patterns of daily variations, but the total number of degree days required before emergence did vary. "Those fish that experienced the two stable regimes accumulated about the same number of degree days that our rule of thumb would predict," says Steel. "But we found that fish exposed to the very strange thermal regimes accumulated a lot more degree days before they emerged, and those exposed to daily variability or seasonal patterns, or daily plus seasonal variability emerged after accumulating fewer degree days." The researchers concluded that how degree days are delivered could affect a salmon's lifecycle. "Just by changing the variability of the temperature pattern, even though we were still delivering about the same amount of temperature every day or every couple of days, we observed a difference in emergence timing equivalent to about a week in a cool stream. So traditional degree-day models aren't sufficient to explain our results," says Steel. Although Steel and Beckman are hesitant to extrapolate too much from the results of their lab experiment, the study builds on an established body of scientific wisdom and leads them to believe that water temperature variability can affect the phenology (the timing of biological events) of aquatic species. Emergence timing, in particular, can be critical for salmon. It can make a life-or-death difference if temperatures cause the fry to emerge from their gravel nest a few days too early or remain a few days too long. "If they come out too early -- say, in the middle of February during a winter freshet -- they're just going to get washed away downriver," says Beckman. "The currents may be too strong for the young fish to resist. If they come out late, the stream may be crowded, leaving no place for an individual to establish its feeding territory. Food sources may not be available or competition for available food may be altered. So the idea is that there's an optimal timing for the juvenile salmon to come out into the water column; if temperature regimes change, we could see higher mortality and/or shifting patterns of mortality (early versus late)." Climate change, dams, irrigation, landscape conversion, and other human activities can lead to altered thermal patterns. Steel suggests that as scientists work toward greater understanding of human impacts and climate change on the lifecycle of aquatic species, it might be prudent to include temperature variability in their protocols and conceptual models. "It's quite possible that there are effects of the changing variability in water temperature regimes, even when the means aren't changing very much," she says. "As scientists try to estimate where species are going to be under different climate conditions, our results suggest that they are going to want to think about the whole thermal regime, not just the mean temperature. It's an additional management tool for species at risk." Decisionmakers often apply landscape models to identify freshwater management pri- orities for conservation and restoration planning and to predict future species distribu- tions; incorporating stream temperature variability into calculations may improve these models. Management decisions for hydropower operations, wetland mitigation, and riparian for- est management can be improved by considering the natural temperature patterns in their full complexity, rather than focusing only on lethal thresholds and total degree days delivered within a given time period. Monitoring freshwater temperature is essential for managing fish and other aquatic organisms. This study provides a rationale for collecting and archiving hourly informa- tion, instead of simply mean or maximum daily temperature. Fisheries management during a changing climate might be improved by considering genetic predispositions that could lead to increased risk or resilience, particularly for listed and endangered species. Salmon evolved in natural river systems, where temperatures fluctuate daily, weekly, seasonally, and all along a stream's path -- from the mountains to the sea. Climate change and human activities alter this natural variability. Dams, for example, tend to reduce thermal fluctuations. Currently, scientists gauge habitat suitability for aquatic species by establishing minimum/maximum temperature thresholds and relying on mean temperature readings to establish management priorities. But temperature effects on salmon are more complex. A new study demonstrates that temperature variability can affect emergence timing in Chinook salmon, potentially altering predictions about how these fish may respond to a changing climate. It also reveals that genetics can make a difference in how an individual responds to stream temperature variance. The study indicates that the commonly used degree-day accumulation model is not sufficient to predict how organisms respond to stream temperature. Changes in how the degree days are delivered have the potential to alter the timing of life history transitions in Chinook salmon and other organisms. Emerging from the gravel a few days earlier or later could directly affect their survival due to changes in available food resources, competition for feeding grounds, or strong currents. Steel, E.A. ; Tillotson, A.; Larsen, D.A. ; Fullerton, A.H.; Denton, K.P. ; Beckman, B.R. 2012. Beyond the mean: the role of variability in predicting ecological impacts of stream temperature. Ecosphere. 3(11): art104. www.esajournals.org/ doi/pdf/10.1890/ES12-00255.1. Sowder, C.; Steel, E.A. 2012. A note on the collection and cleaning of water tempera- ture data. Water. 4: 597-606. www. mdpi.com/2073-4441/4/3/597. Steel, E.A. ; Lange, I.A. 2007. Alteration of water temperature regimes at multiple scales: effects of multi-purpose dams in the Willamette River basin. River Research and Applications. 23: 351-359. onlinelibrary.wiley.com/doi/10.1002/ rra.985/pdf. Marie Oliver specializes in science writ- ing and developmental editing. She can be reached through her website at www. claritywriting.com.